For whatever reason, in the year I decide to practice having a little more moxie, I’m given an opportunity twice to test it with my favorite author. I don’t know how I got so lucky. And strangely, since pushing myself out of my comfort zone to meet her that first time, despite being terrified going into it, it seems to have had a huge impact on my social anxiety. Since that first event, I’ve agreed to do stranger photo shoots more frequently, cut off 10″ inches of my hair (after hiding under my long hair for almost a decade), and even attended a writing conference. I’m not saying that I wasn’t still nervous about these things, but it doesn’t feel crippling anymore. I’ve let the excitement override the fear for once and it’s such a freeing feeling. It doesn’t mean I won’t still be socially awkward, words will still stumble over themselves whenever I try to speak, but I just don’t feel as afraid of it anymore. It is what it is and I think I’m growing okay with that. Tonight I got to meet Maggie again, here in my own county’s library. I was amazed by how NOT nervous I was about it. It felt more like I was going to hang out with an old friend or something. I only looked forward to it, without an ounce of fear. Even as a stranger sat down beside me (a stranger who ended being entirely sweet and not so much a stranger anymore), I didn’t feel afraid, just happy. How odd, I kept thinking, that the first event could have felt so different. Sure the last event was amplified by the heat and small space, but everything about this felt different, in a good way. Maggie made it to the event in her camaro, which is brave if you ask me considering the fit it gave her during the Sinner Tour. She was welcomed into Aberdeen by getting pulled over by a cop right outside the library (never a dull moment for her where cars are concerned, I think). Her speech was mostly the same as the one I’d seen at the first event, but far more practiced. Maggie is an entertainer, all around. Her confidence and comfort level puts a crowd at ease. And if she’s battling any internal awkwardness, it’s impossible to see. She’s dramatic and energetic and I think I could listen to her talk about how her books came to be over and over again. I am a sponge that wants to soak up as much of her craft as possible. The library setting was 100% more comfortable than the first event. We had chairs to sit in and a smoother running signing line. There was a podium set up for her, but even before she got there, I knew she wouldn’t use it. 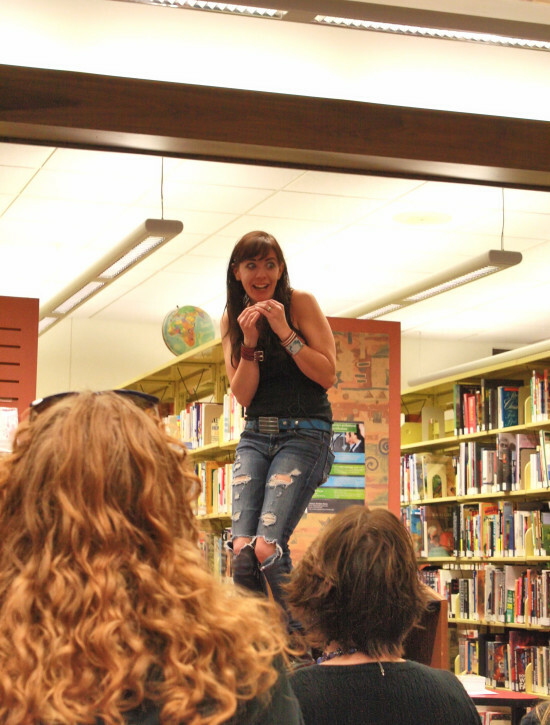 I’d mumbled to the girl beside me, “I bet she gets on that table,” and sure enough, she jumped onto it mid ‘band’ story. I sort of wish there’d been a longer Q & A after because while some questions are ones I’ve heard the answers to before, this is where you learn some unexpected things. I also wish I’d gathered my thoughts enough to ask my own question, though I’m sure it would have been targeted more towards the How To’s of writing and less about her books, which would have probably bored the crowd. 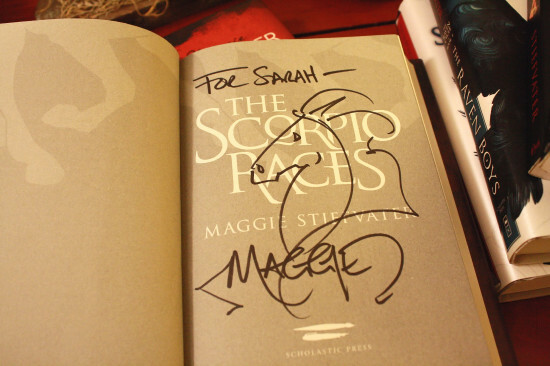 I did, however, bring all the rest of her books to have signed this time and I hadn’t noticed it while she was signing because I was talking her ear off, but she drew a horse in my copy of The Scorpio Races! I don’t know if she does this to all Scorpio Races or if it was because I told her it was my favorite of her books, but I love it either way. I’ve always wanted one of her doodles. And because I pre-ordered Blue Lily, Lily Blue (Raven Cycle, Bk3) from the library, I also got the bookplate she designed for it. Can’t wait to slap it in my copy when it gets here! Overall it was an awesome event and I’m so grateful not only to have gotten two opportunities to meet my writing hero this year, but that it was her coming here that has let this moxie resolution flourish. The social anxiety weight I’ve carried around for so long feels so much lighter now and I kind of can’t stop smiling about it. Thank you, Maggie. Click through the slideshow below! 2 Responses to "On Moxie and Meeting Maggie Stiefvater Again"
How cool that you got to meet Maggie again, and that she even sketched in one of your books! (Despite being an artist myself, I have no idea how others ever manage to do that. I’d mess up for sure, heh.) And that’s especially great about your social anxiety not weighing you down so much. Hope the moxie-ness lasts!